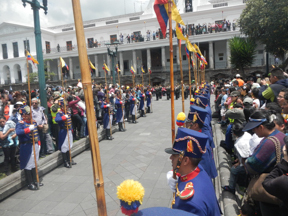 Every Monday at 11am is the changing of the guard at the Palacio de Gobierno, the presidential palace in the Plaza Grande in Quito. 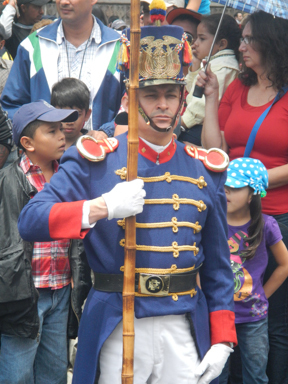 I walked about half way from my hostel to the Plaza and, when I realized I wasn’t going to make it on time, I hailed a taxi and got there about 15 minutes before the pomp and circumstance began. 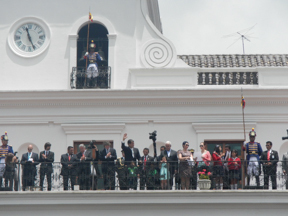 Promptly at 11am, President Rafael Correo comes out onto the balcony to oversee the spectacle. That’s him in the center of this picture waving to the crowd. 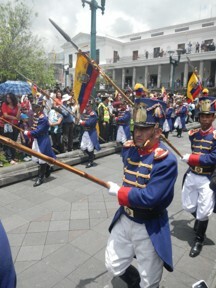 The guard moves into place. 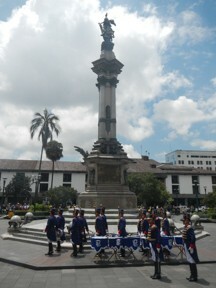 The band plays the national anthem and everybody joins in. 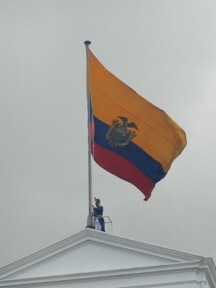 The flag is raised on top of the Palacio de Gobierno and everybody cheers. 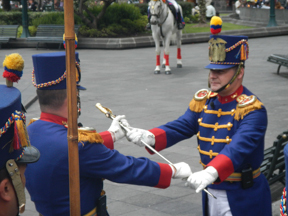 The ceremony leads to the passing of the ceremonial sword. 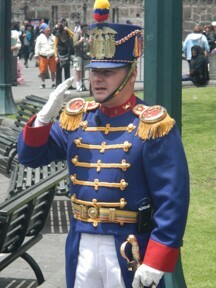 The changing of the guard lasts about 30 minutes. 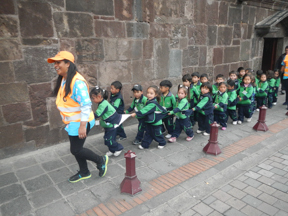 Little schoolchildren had back to the bus for the return trip to school. 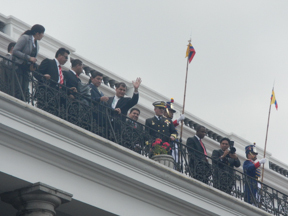 And President Correo makes one last trip to the rail to wave to the crowd. 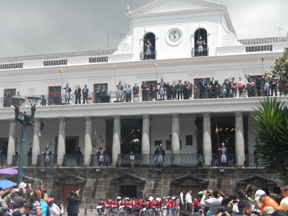 I wanted to take a tour of the presidential palace but didn’t for two very good reasons. 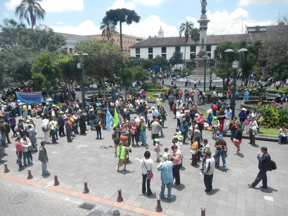 One, all of the tours for the day were already booked and second, they are in Spanish. I did get up on the first balcony to take one picture looking out to where the crowd had been. I took a leisurely walk back to the area of my hostel. 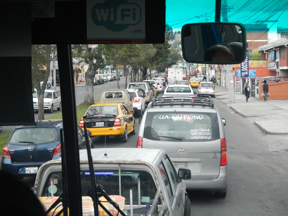 I ate lunch at an outdoor patio cafe, and then the hostel owner called me a taxi for a 15 minute $6 ride to the OLD airport where I caught a bus for an $8, hour and a half ride in bumper to bumper traffic to the NEW airport. The taxi ride directly to the New Airport is $25 and takes about two hours depending on the time of day. My waiting for my departure last night, I visited with a photographer about my age who was in Ecuador looking at possible places to retire. He was taking his newly gathered information back to his wife in Florida where they’d narrow the location possibilities before making another trip to Ecuador. He told me he could find a nice, fully-furnished apartment with a pool and utitilties for $400-$500 per month. My flight left Quito on LAN Airlines at midnight and arrived in Miami about 5am. I even got dinner at 2am with wine, beer, soda or juice included. I had a three hour layover to clear Immigration and Customs and the headed home on American Airlines. I was back in Dallas about 10:30am. I’ll have at least one more posting on some other aspects of the trip tomorrow.